DIE Mercurii, 24 die Octobris. E. of Crawford, & al. Petitions against it, to be heard. Hodie 2a vice lecta est Billa, "An Act to enlarge the Time given by a former Act for Redemption of Mortgages made by the Earl of Cleveland." Next, was read a Petition of the Earl of Crawford and the Lady Belbaven's, desiring to be heard before the Bill of the Earl of Cleveland did pass. Viscount Say & Seale Epus. London. Their Lordship, or any Five; to meet on Friday next, at Three of the Clock in the Afternoon, in the Prince's Lodgings. It is ORDERED, by the Lords Spiritual and Temporal in Parliament assembled, That the Earl of Cleveland and the said Petitioners shall be heard, by their Counsel on both Sides, at the Bar of this House, on Wednesday the One and Thirtieth Day of this Instant October, concerning the Matters mentioned in the said Petition, relating to the said Bill. Hodie 2a vice lecta est Billa, "An Act for the Illegitimation of the Children of the Lady Anne Ross." 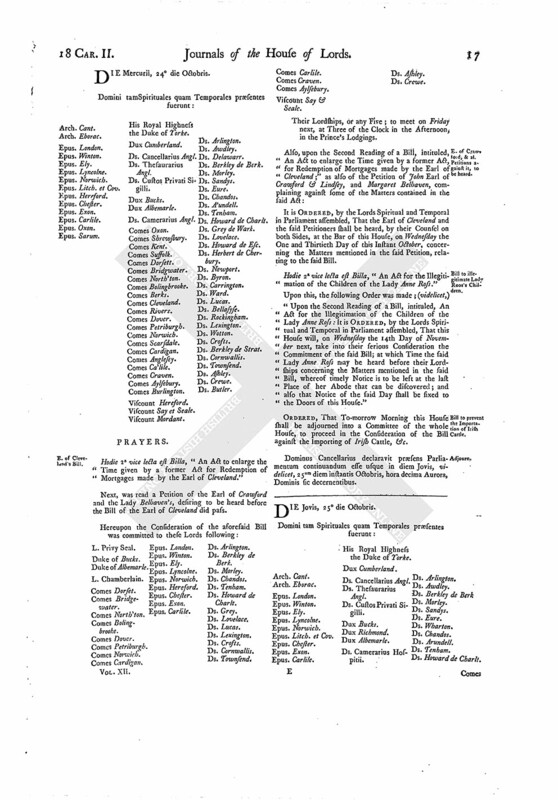 "Upon the Second Reading of a Bill, intituled, An Act for the Illegitimation of the Children of the Lady Anne Ross: It is ORDERED, by the Lords Spiritual and Temporal in Parliament assembled, That this House will, on Wednesday the 14th Day of November next, take into their serious Consideration the Commitment of the said Bill; at which Time the said Lady Anne Ross may be heard before their Lordships concerning the Matters mentioned in the said Bill, whereof timely Notice is to be left at the last Place of her Abode that can be discovered; and also that Notice of the said Day shall be fixed to the Doors of this House." ORDERED, That To-morrow Morning this House shall be adjourned into a Committee of the whole House, to proceed in the Consideration of the Bill against the Importing of Irish Cattle, &c.
Dominus Cancellarius declaravit præsens Parliamentum continuandum esse usque in diem Jovis, videlicet, 25um diem instantis Octobris, hora decima Aurora, Dominis sic decernentibus.